Among the types of massages offered are Swedish, deep tissue, sports, hot stone and myofascial release massages and craniosacral therapy. Not only can the daily strains of work be stressful to our minds and emotional health but it can also have an effect on our physical health. 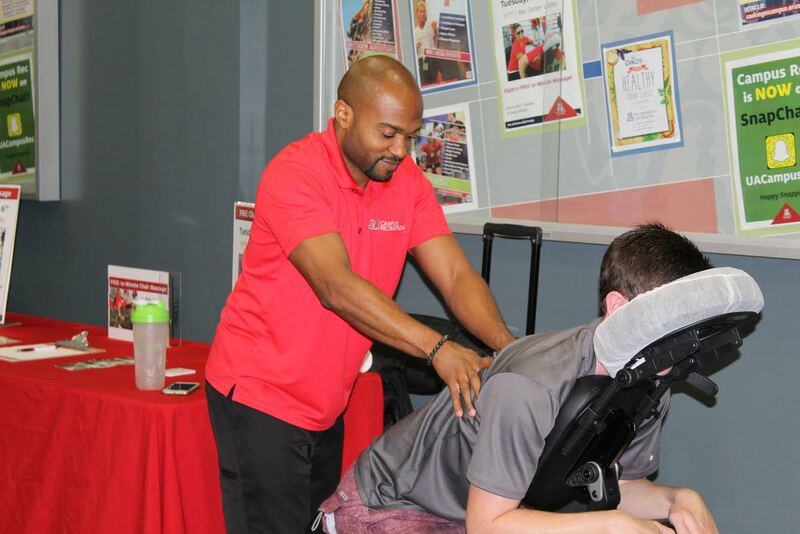 Campus Recreation's RecSPA gives employees a chance at relief from those daily aches and pains by offering professional massages right on campus at an affordable price. Introduced in 2012, RecSPA is a professional massage therapy service that aims to offer a holistic approach to health. It's located in the Student Recreation Center, next to the Smart Moves studio, which is a workout facility for faculty, staff and graduate student use. "Campus Recreation is not just about fitness anymore," said Shelby Gunter, member services coordinator for Campus Recreation. In addition to activity classes, intramural sports, weightlifting, youth and family programs, Campus Recreation offers visitors access to RecSPA's team of licensed massage therapists. Among the types of massage offered are Swedish, deep tissue, sports, hot stone, myofascial release and craniosacral therapy. A new massage being offered is "cupping," an ancient form of therapy that was highlighted during the 2016 Olympics in Rio de Janeiro. The therapy uses suction to improve blood flow and remove toxins from the body. Madeline Fuhrman, a pre-business major in the Eller College of Management, sought RecSPA's services after experiencing residual pain from two back surgeries. She says the myofascial release therapy, a massage therapy that involves applying pressure to the myofascial connective tissue to treat chronic pain in muscles throughout the body, reduced her pain. Massage services range in price from $30 to $100, depending on the length of the appointment. Campus Recreation members pay the same amount as nonmembers. "We are one of the most cost-efficient massage therapy spas throughout Tucson," Gunter said. "I try to keep an eye on what Groupon is offering, and I’ve learned that any time you can get a 60-minute massage for less than $60 you are getting a competitive price." On the first Tuesday of every month, massage therapists offer free chair massages in the lobby of the Student Recreation Center. Gunter says that the professional massage therapists focus on overall health. "I believe that massage is not only a wonderful stress relief, but also beneficial to a person's posture and overall comfort throughout the workday," she said. "Massage therapy services are up-and-coming at many college campuses since students and employees have found massage to be very beneficial for mind and body well-being." Employees can book a massage by visiting the Campus Recreation website or the Student Recreation Center's front desk. For more information, call 520-621-8702 or email Gunter at sgunter@email.arizona.edu.